The Roxburghe Hotel near Kelso is one of the Scottish Borders’ most elegant wedding venues, in a lovely woodland setting on the River Teviot. It caters to both intimate weddings and large parties. The Dining Room seats 48 guests, the Conservatory 56 guests, and the smaller Roxburghe Room will seat 14 guests for a more intimate occasion. Larger events for up to 250 can be accommodated in a marquee located in the attractive gardens. Exclusive use of the hotel means you and your guests will be the only people strolling in the magnificent grounds or enjoying a whisky in the Roxburghe’s Library Bar. 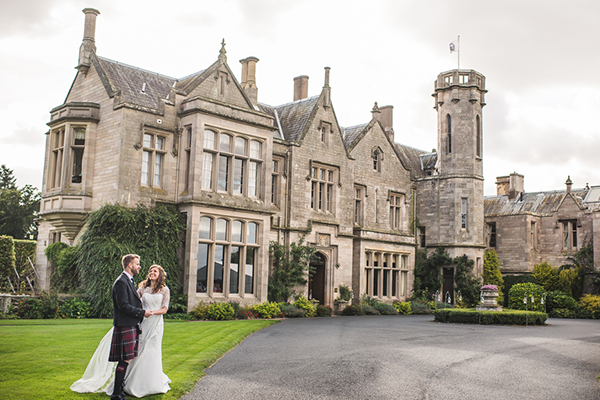 Beauty treatments with the hotel’s resident beautician, or a round of golf on the championship course right on the doordstep, make a wedding at the Roxburghe a lovely way to spoil your friends and family. The Scottish Borders – and particularly Kelso – is an excellent destination for sport and outdoor lovers. As well as the Roxburghe’s championship golf course, you’ll also find world-class salmon fishing, grouse and clay pigeon shooting, croquet and woodland walks nearby. Get Knotted has a great deal of experience in styling elegant weddings and flowers for couples, and has a beautiful range of wedding props for hire. We’re very close by, so if you’re visiting the hotel, do pay us a visit to see our props and get some inspiration!